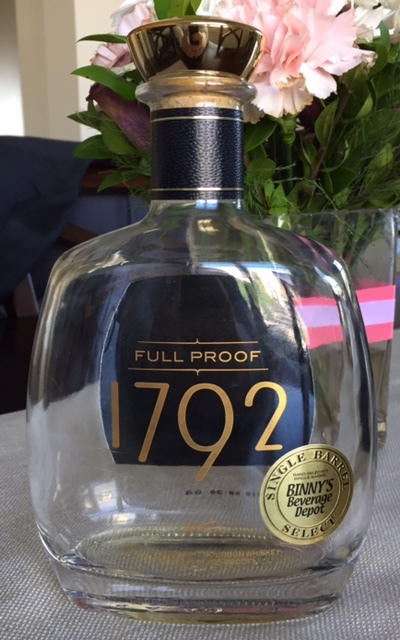 Having had my eye out for the 1792 Full Proof as soon as I heard of its release, it was a no-brainer for me to grab this one off the shelf. At $50, just the fact that it's a barrel strength release from one of the big guys makes this a reasonable buy. I've come to love what 1792 has been producing, so I was very excited to try this one. The nose is softer than expected and quite sweet. It certainly didn't hit me like a ton of bricks, either with alcohol burn or flavor. However, the sweet smell was reminiscent of cinnamon and raisin bread with brown sugar. An incredibly pleasant and enjoyable smell, so much so that I sat there sniffing my glass for a good few minutes before taking the first sip. The first thing that I noticed about this high-proofer is the minimal amount of burn. The fact that the high alcohol content didn't seem to get in the way really allowed all the flavor to come through, and this whiskey is certainly full of flavor. It had a long spicy finish, kind of a blend of cinnamon and black pepper spice. That spiciness seemed to linger forever both in the mouth and at the back of the throat. Up front was a delicious blend of plum and almond. It was sweet, but only subtly sweet, but was still very rich. Those flavors were rounded out by a light smokiness that was strong enough to be noticed and not strong enough to detract from the other flavors. It was really more savory than expected, as the nose had me thinking this was going to be a dessert (or possible a breakfast) whiskey. As good as it was on that first pour, this bourbon only got better from pour to pour. Towards the end, the more traditional caramel and vanilla flavors came through, and they really complemented the plum and almond notes that I was noticing previously. The peppery spice seemed to dissipate and it eventually developed that sweet cinnamon note that I expected from the nose. From beginning to end, despite the noticeable transformation, this bourbon was absolutely delicious. At this price, for what you're getting, it's absolutely worth it and I wouldn't hesitate to buy it again!